Environmentalists spread out a banner at the Sagittarius Mines exhibit booth during the International Mining Conference and Exhibit at the Sofitel Hotel in Manila. Manila, Philippines (Mindanao Examiner / Sept. 17, 2011) – Filipino mining activists and tribesmen have renewed calls for the government to put a stop to mining activities in Mindanao because of its destructive effect on the environment. 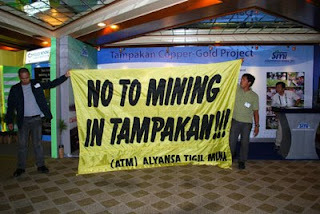 They also staged a rally - which coincided with the International Mining Conference and Exhibition hosted by the Chamber of Mines of the Philippines at the Sofitel Hotel- to dramatize their protest against the $5.2-billion Tampakan Copper-Gold Project of Sagittarius Mines, Inc. (SMI), saying it will only worsen the lives of the people of Tampakan town in South Cotabato province. SMI said its project will improve lives and give sustainable benefits to communities. “We do not believe SMI and the national government when they say that the $5.2-billion direct investments will be good for the Philippine economy if we are to look at the impacts of this mining project to communities,” said Rene Pamplona, representative of the Diocese of Marbel in South Cotabato (SAC-Marbel). “First, the earning from minerals that will be taken from our lands will not directly benefit the country. Second, the grave impacts of mining operations to the environment and water resources of four provinces. Third, the inevitable impact to the livelihoods of local residents and lastly, the FTAA literally takes away the ancestral lands of B’laans. We also cannot discount the fact that social ills caused by these happening,” he added. FTAA refers to Financial and Technical Assistance Agreement. The Xstrata-SMI Financial and Technical Assistance Agreement covers 23,571 hectares in four provinces - South Cotabato, Sultan Kudarat, Davao del Sur, and Sarangani. A total of 10,000 hectares will be directly impacted by the mining operations. Expert studies of the SMI draft Environmental Impact Statement for the mining project found that the mining project will result in extensive physical disturbance of forest lands, including old growth forests, threat water resources of four provinces, and further bring about tribal conflicts. The mining operations overlap with four ancestral domains, Pasimio said. Activists said proponents of the Tampakan mining project are now lobbying the Office of the President and the Department of Interior and Local Government to suspend the provision of the South Cotabato Provincial Environmental Code that bans open pit mining in the area—a move that will undermine the law passed by the local government in June 2010.